This is so disturbing that it makes me realize just how heartless and delusional these apologists are. Day in and day out living sentient beings are being maimed and killed for $2 bets. How in the hell can any politicians be insane, stupid, or greedy enough to accept this business as anything other than legitimized animal cruelty? Not only that, but they rescue this dead and dying business with millions of precious taxpayers money, corporate welfare, or casino profits – all of which should be going to community essential projects. Local residents, horse lovers, and the community are all being continually drowned out by the horse racing industries direct line to politicians and the cash to back it up. The racehorses have no voice, no say in the matter as they are exploited for these creeps often leading to their public executions. 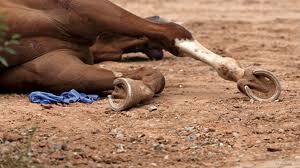 It’s so sad – sorry to all the racehorses whose lives were forever maimed or for those killed this past week. Legitimized animal cruelty – that says it all and has to stop.